An official investigation into the death of Diana, Princess of Wales, and two companions in a Paris car crash nearly 10 years ago has ruled out foul play. The inquiry, headed by former Metropolitan Police Commissioner Lord Stevens, was ordered by Surrey coroner Michael Burgess when he opened the inquest on the princess in 2004. The final moments of the princess and her close friend, Dodi Al Fayed, son of Harrods owner Mohamed, have become the focus of constant - and often frenzied - speculation. But many details have now become clear. On Saturday, 30 August, 1997, the princess and Mr Al Fayed return from a Mediterranean cruise together, flying from Sardinia to Le Bourget airport on the outskirts of Paris. They are driven initially to one of Mr Al Fayed's properties in the capital before going on to the Ritz hotel, in the city's fashionable Place Vendome, part of the Al Fayed empire. During the evening the couple cancel a dinner engagement at a restaurant in the city because of the enormous press attention their presence has generated. They dine instead at the Ritz, in a private suite. Mr Al Fayed hatches a decoy plan to try to throw the paparazzi gathered outside the hotel off the scent so that he and Princess Diana can drive to his apartment. While their normal vehicle would leave from the front of the hotel, the couple would leave from the rear. At about 0020 on Sunday, 31 August, a Mercedes S280 saloon, leased by the hotel and driven by one of its security staff, Henri Paul, leaves by the rear of the building. Next to Mr Paul in the front is Trevor Rees-Jones, a bodyguard employed by the Al Fayed family. The princess and Mr Al Fayed sit in the back. None of the occupants is wearing a seatbelt. According to the report of the official investigation by French examining magistrates, Mr Paul had a drink problem and was not licensed to drive passengers in the vehicle he was using. Lord Stevens' report revealed subsequent blood tests showed an alcohol level almost twice the UK legal drink-drive limit. Despite the earlier decoy, the car is pursued by some press photographers, although official records suggest none got close to the vehicle as it sped along the north bank of the Seine. 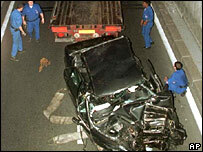 At 0023, just five minutes after leaving the hotel, the Mercedes crashes as it enters the underpass under the Place d'Alma, hitting the kerb before being thrown against one of the tunnel's pillars. Tests suggest the car had "glancing contact" shortly before entering the underpass with a white Fiat Uno that was never recovered, although the French report concluded it had no direct role in the crash. Subsequent examinations concluded that the Mercedes carrying the princess and Mr Al Fayed was travelling at 118km/h (73.3mph) to 155km/h (96.3mph) just before the crash and hit the kerb at about 98km/h (61-63mph) - twice the speed limit for that section of road. 0026 Within a minute, the emergency services receive their first call to the scene. The first fire crew arrives at 0032. The crushed Mercedes is resting against a pillar. 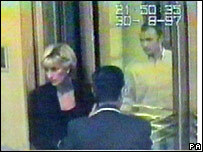 Princess Diana, still conscious, is in the rear floorwell; Mr Al Fayed stretched out on the seat, apparently dead. Mr Rees-Jones is also conscious in the front passenger seat, but suffering serious injuries. Mr Paul is dead. Doctors and passers-by tend to the princess, and she is finally released from the wreckage at 0100. She requires a lot of medical attention at the scene before being taken by ambulance to the Pitie-Salpetriere hospital. 0130 Mr Al Fayed is pronounced dead at the scene of the accident. The princess arrives at hospital, still alive, at 0206. Despite medical attention, Princess Diana dies of her serious heart and lung injuries. She is declared dead at 0400.